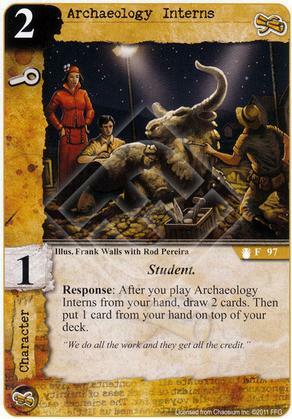 Response: After you play Archaeology Interns from your hand, draw 2 cards. Then put 1 card from your hand on top of your deck. Flavor Text: "We do all the work and they get all the credit." IMO, the Interns are an example of a character that has a nice ability, but not an exceptional ability. If the ability isn't exceptional then the body becomes more important. With a similar body as Bedlam Boys, but less of an ability, I have to give the Interns 4 stars. Still a good card but not the automatic 3x that a lot of people make it out to be IMO. I like this card, and it has great synergy with Professor Morgan, but I often find I just don't have room for it in my deck when I play explorers. Arctic Enthnolgist or Lucas Tetlow both feel like stronger round one plays. It's not like Explorers really need any card draw whatsoever once Roald Elsworth hits the table. Still, solid card, somewhat relevant subtype and some shenanigans with manipulation of the top of your deck have become a thing (Audubon specifically).